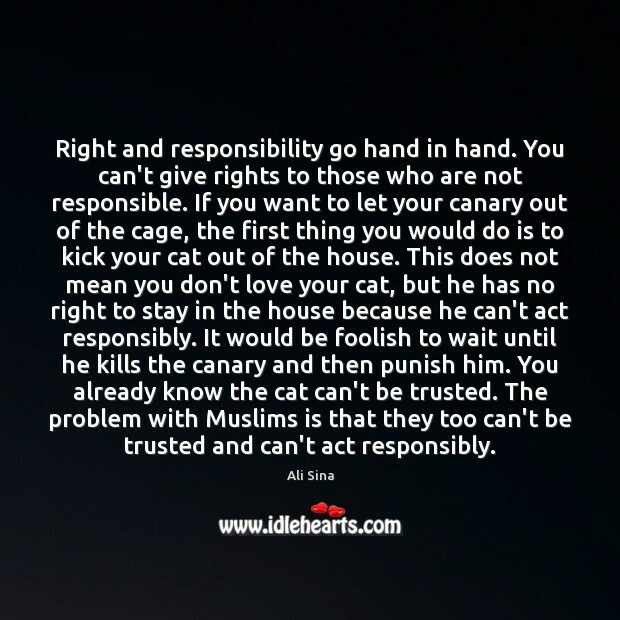 Enjoy the best inspirational, motivational, positive, funny and famous quotes by Ali Sina. Use words and picture quotations to push forward and inspire you keep going in life! 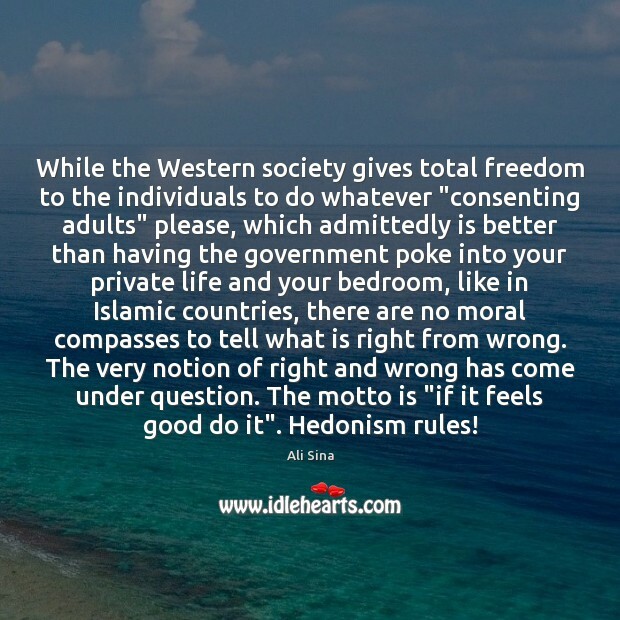 While the Western society gives total freedom to the individuals to do whatever "consenting adults" please, which admittedly is better than having the government poke into your private life and your bedroom, like in Islamic countries, there are no moral compasses to tell what is right from wrong. The very notion of right and wrong has come under question. The motto is "if it feels good do it". Hedonism rules! 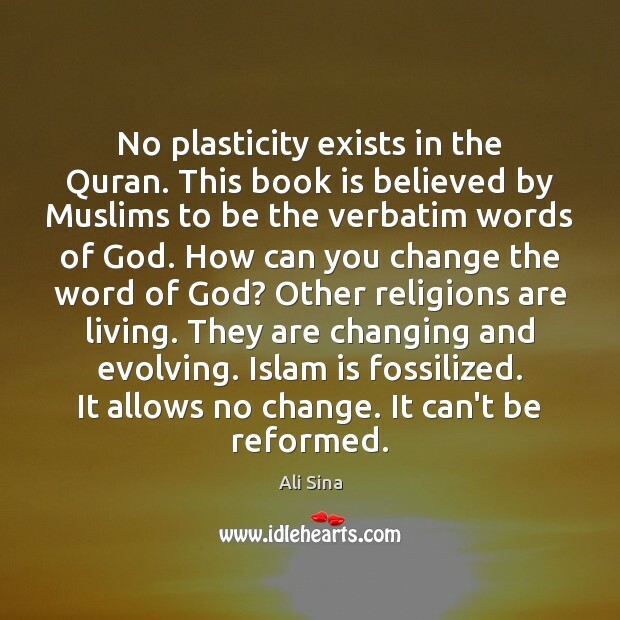 No plasticity exists in the Quran. This book is believed by Muslims to be the verbatim words of God. How can you change the word of God? Other religions are living. They are changing and evolving. Islam is fossilized. It allows no change. It can't be reformed. Political correctness is a major defect of the western ethos. Some Western countries have even passed blasphemy laws that would put you in legal hot waters if you say anything negative about Islam. This means that the truth about Islam cannot be said but Muslims are given total freedom to spread their religion with lies. Islam thrives were truth is suppressed. 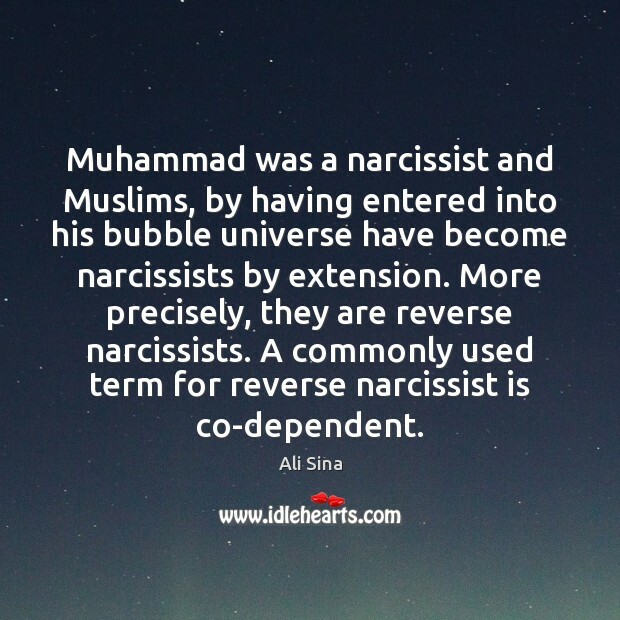 That is one reason that westerners convert to Islam. They are lied to. How do you expect a society to survive when truth is banned and lies are allowed? Muslims insult all other religions. The Quran is an insult to the Jews, the Christians and everyone else. It calls the Jews apes, pigs and rats. All the non-believers are najis (filthy, impure) and hell bond. 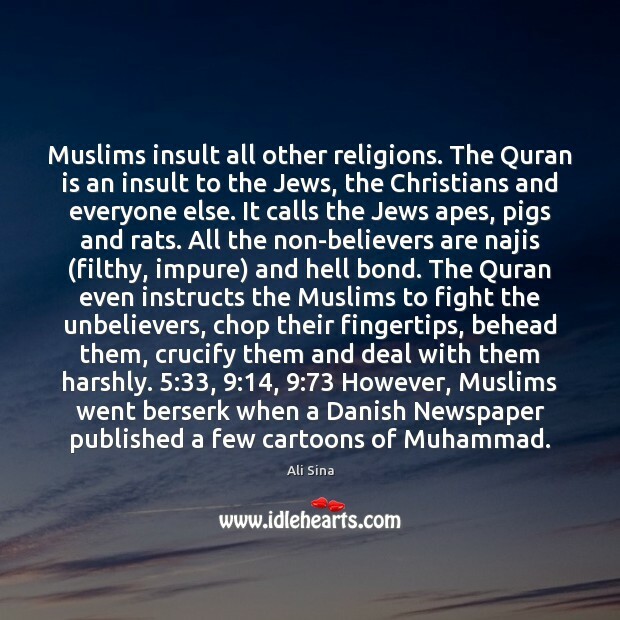 The Quran even instructs the Muslims to fight the unbelievers, chop their fingertips, behead them, crucify them and deal with them harshly. 5:33, 9:14, 9:73 However, Muslims went berserk when a Danish Newspaper published a few cartoons of Muhammad. Words can mean different things to different people. It is important to understand what people mean when they use a certain word. Let's make an example. Take the word gay. Fifty years ago, gay meant exclusively cheerfulness, lighthearted excitement, merry or bright colors. Today this word has a different meaning. 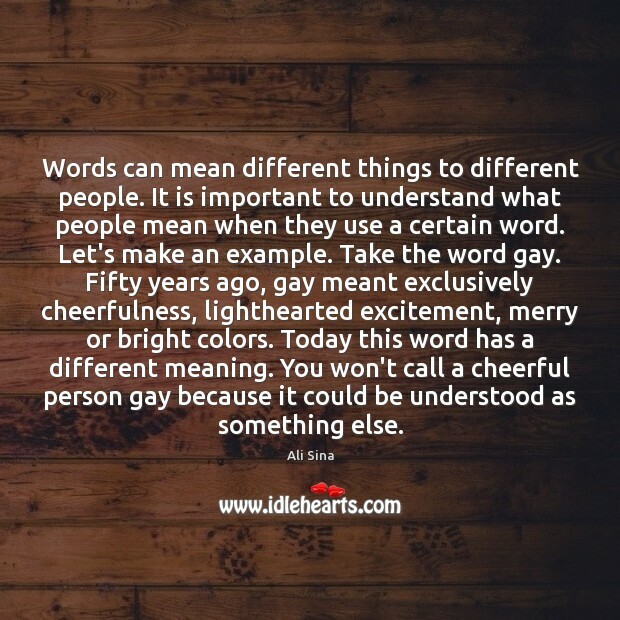 You won't call a cheerful person gay because it could be understood as something else. 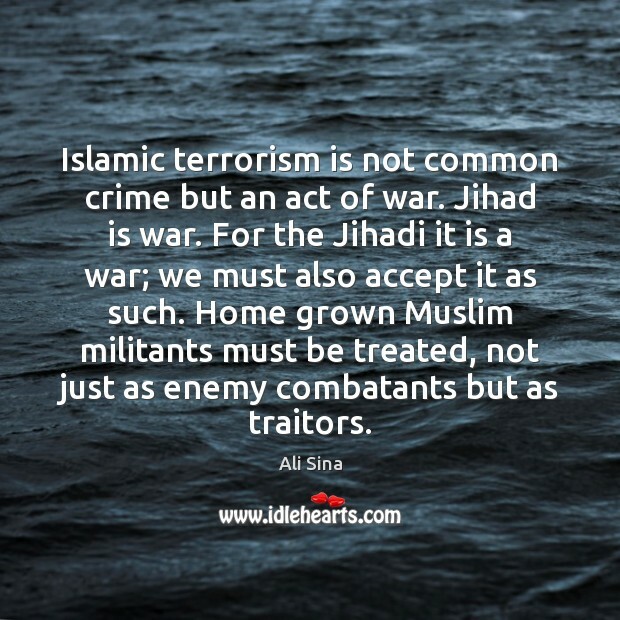 Islamic terrorism is not common crime but an act of war. Jihad is war. For the Jihadi it is a war; we must also accept it as such. Home grown Muslim militants must be treated, not just as enemy combatants but as traitors. There is no compulsion in Islam. You convert "voluntarily". 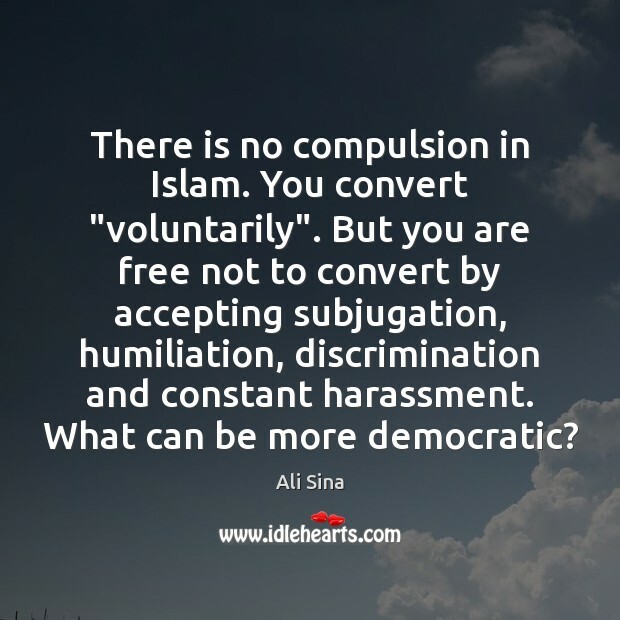 But you are free not to convert by accepting subjugation, humiliation, discrimination and constant harassment. What can be more democratic? Islam takes advantage of two structural flaws that exist in the Western society. 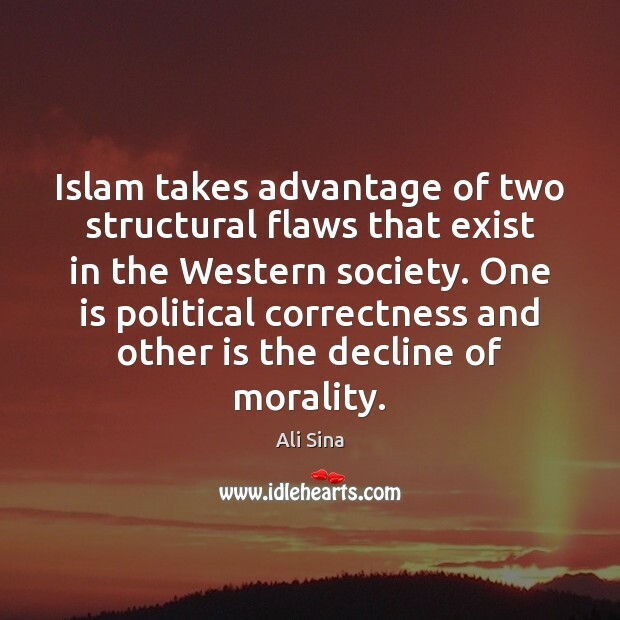 One is political correctness and other is the decline of morality. 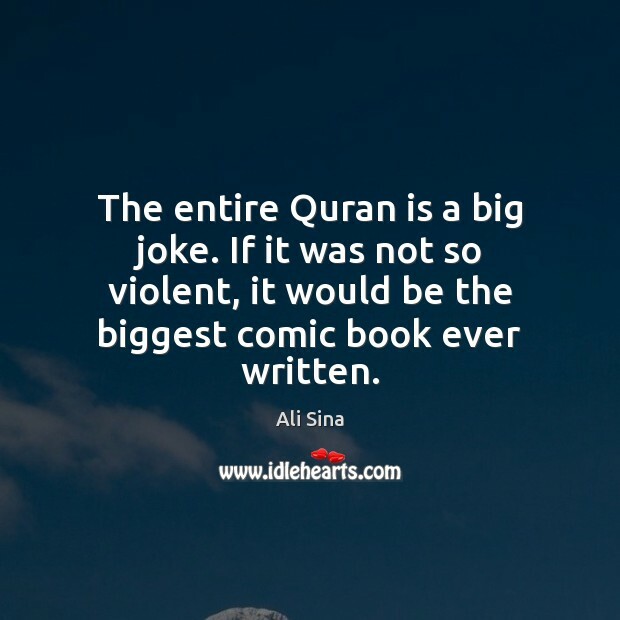 The entire Quran is a big joke. If it was not so violent, it would be the biggest comic book ever written. We are living in a culture that if you criticize immorality you could be branded as a "bigot". I am going to lose a lot of support just by saying this. I am not a politician and I am not running a popularity contest. My job is to defend our world from Islam. You asked why the westerners convert to Islam and I must tell the truth as I see it. If that offends anyone, let him be offended. 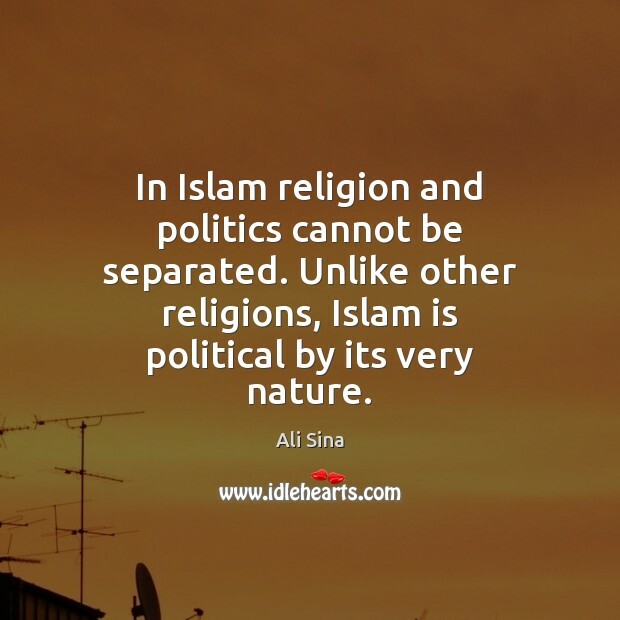 In Islam religion and politics cannot be separated. Unlike other religions, Islam is political by its very nature. Talking about morality can be offensive. Morality is a politically incorrect subject. 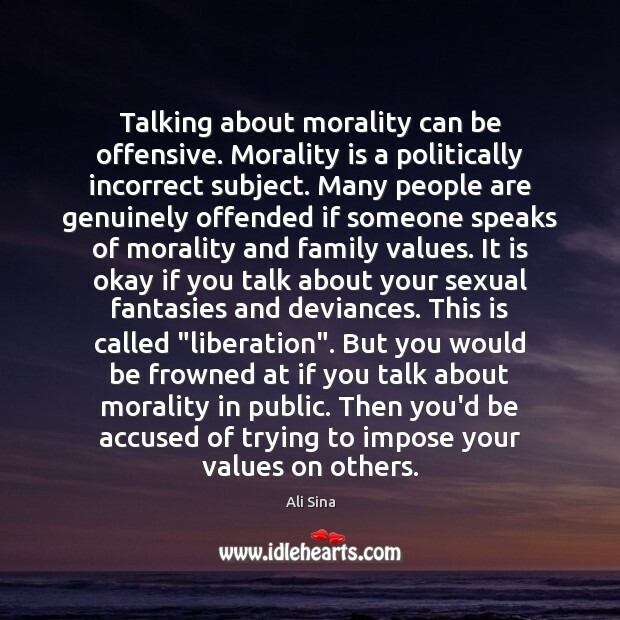 Many people are genuinely offended if someone speaks of morality and family values. It is okay if you talk about your sexual fantasies and deviances. This is called "liberation". But you would be frowned at if you talk about morality in public. Then you'd be accused of trying to impose your values on others. One thing is to have the protection of human rights for homosexuals and quite something else is this promotion of indecency. It would be immoral and unethical to deny the homosexuals their human rights. But it is also immoral to consider disorders as normal. None of these deviances are biological. They are acquired by fantasizing about them. 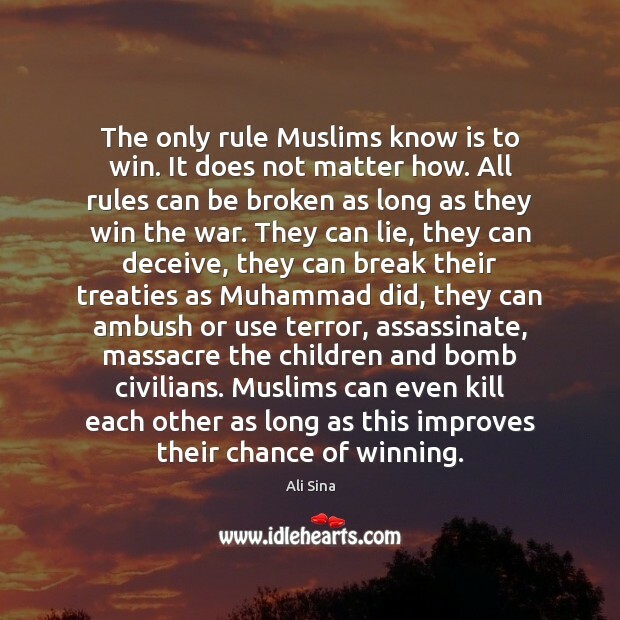 The only rule Muslims know is to win. It does not matter how. All rules can be broken as long as they win the war. They can lie, they can deceive, they can break their treaties as Muhammad did, they can ambush or use terror, assassinate, massacre the children and bomb civilians. Muslims can even kill each other as long as this improves their chance of winning. 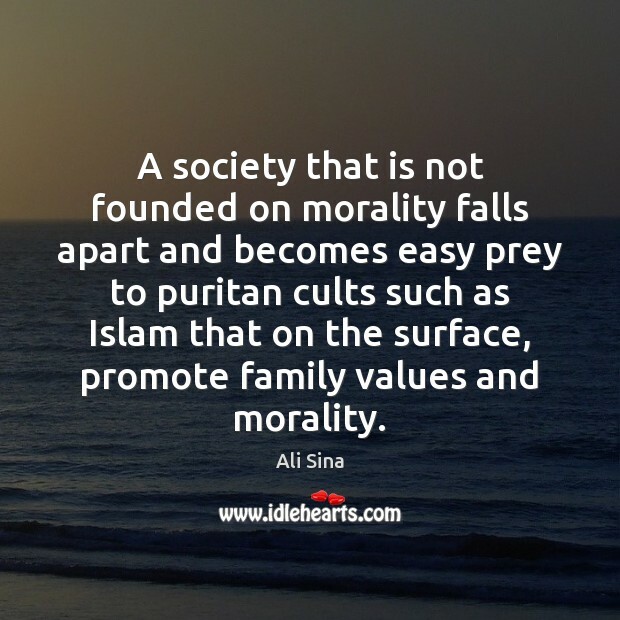 A society that is not founded on morality falls apart and becomes easy prey to puritan cults such as Islam that on the surface, promote family values and morality.